Mike: Last week we started our story on Dewey Bonbrake, airplane builder. If you haven’t read part one yet, don’t miss the adventure; grab a copy of last week’s paper. By the time Dewey built the prototype for his new airplane design, one that improved upon the Bahl Lark, he was married and had a daughter. Using the 40-horsepower French Anzani engine off the Lark, Dewey began looking for financiers to put his Bonbrake Parasol into production. Utilities mogul, Samuel Insull, invested in Dewey’s dream, and the airplane became known as an Inland. Insull, an English immigrant, resided mostly in Chicago, but his holding company had interests in many states. He was one of the most powerful merchants in U.S. history, a tycoon who once served as the personal secretary to Thomas Edison and founded Edison General Electric. Insull had interests in other electric, coal and gas companies, railroads, Chicago radio, and was instrumental in building the Chicago Civic Opera House. Many of his businesses were named Inland. 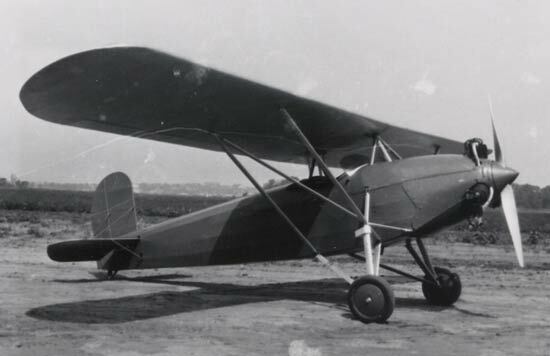 Dewey’s friend, Tom “Gene” Gabbert, an engineer and test pilot for Unit Motors & Airplane Co. of Kansas City, Missouri, took the prototype to Los Angeles for the 1928 National Air Races, and brought Arthur Hardgrave along. Hardgrave, who was also a pilot and wealthy businessman in his own right, worked for Insull as President of City Ice, and was president of the Kansas City Chamber of Commerce, and the Rancho De La Osa Guest Ranch outside of Tucson. On the way from Kansas City to Los Angeles they landed at Davis-Monthan (in Tucson), the first municipal aviation field in the U.S. Davis-Monthan’s historic register records airplanes that have landed there, their pilots and passengers, between 1925-1936. That register has the signatures of Gabbert and Hardgrave, who signed it on the morning of September 5, 1928. According to http://www.dmairfield.com/, the register records seven landings by six different Inlands. The website offers a good narrative on each of the Inlands listed. Their next stop was the Guest Ranch. 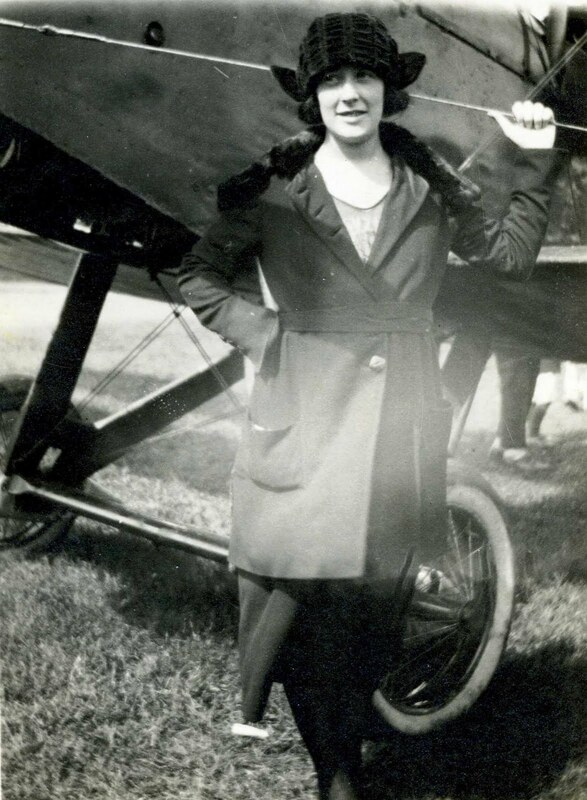 Linda: With Insull’s backing, Inland Aviation Co. began producing airplanes at Fairfax Airport in Kansas City. The Inland Sport was built in the same building as the Rearwin; American Eagle, and others were built at Fairfax as well. Opening for business in 1928, Inland Aviation announced its first commercial airplane in September, 1929 in Aviation Magazine and other publications. In 1929 and 1930 the Inland held several altitude and speed records, one with a 110 HP engine up to 19,000 feet, breaking the 18,000’ record; and a 125+ mph closed course speed record. 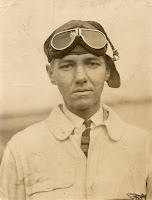 Inland Aviation placed well in several air races including the 1930 National Air Races in Chicago where female pilots Mae Haizlip, Vera Dawn Walker, and Marty Bowman flew Inland Sports, and Arthur Hardgrave captured first place in the Sportsman class followed by Inlands in second and third place. These finishes gave the company a boost. By now they had three models: the Sport, a 70HP LaBlonde, a five cylinder radial which sold for $3,500, the Sportster, a 90HP five cylinder Warner Scarab Jr. offered for $3,700, and the Super Sport, a 125HP Warner Scarab, seven cylinder radial with a price tag of $4,500. We’ll have more on the fascinating Bonbrake-Inland story next week. Linda: Back in the olden days boys used to tinker, and make things. They had projects and used their minds and worked with their hands. Lawrence Dewey Bonbrake was one such boy. Born in 1899 in Woodston, Kansas, Dewey was a bright kid, always into stuff. For instance, he and a cousin built a glider and flew it off the roof of a barn when they were teenagers. Then they built a sled powered by a motorcycle engine, with a propeller. When Dewey rode it 19 miles to the next town, Stockton, someone wrote an article about him, a 15 year old kid with a powered sled. In 1912 when an aviator flew in to town offering rides, to say Dewey, then 13, was intrigued would turn out to be an understatement. With a brilliant and inventive mind, he began studying at Valparaiso University in Indiana, and though he didn’t graduate he learned enough about engineering that by the time he was 19 he designed a single pilot air ambulance, using a Liberty engine. Not long after, Dewey acquired a Curtiss JN4 Jenny as Army surplus, learned to fly it, and became a barnstormer, which led to, among other things, meeting his future wife. Dewey happened to walk in to an ice cream shop in Kansas City, where the lovely young Leona Allita Lamb had stopped in for a tasty treat. She was the daughter of prominent saddle maker Willie Lamb, of Arkansas. The daring, dashing young man all dressed out in his jodhpurs and helmet and goggles, swept Leona off her feet. A beautiful family and more great adventures were yet to come. Mike: One time while flying his Curtiss Jenny across Arizona Dewey ran out of gas and landed in the desert. His hand was cut and infected by cactus, and he almost died from exposure, but he was rescued by someone passing through in a donkey cart. They helped him get gas for his airplane and he off he went, back into the sky. 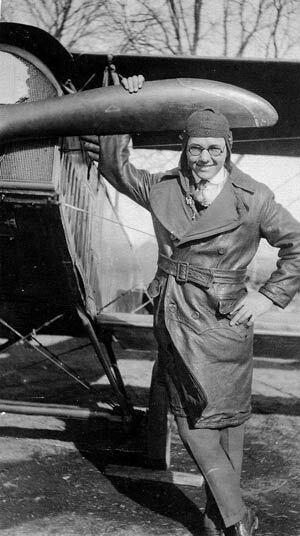 Once a man convinced Dewey he was a pilot, talking him into letting him fly the Jenny. Since a Jenny is flown from the back seat, Dewey had removed the control stick from the front seat where the passenger rides so that none of his passengers would have control of the airplane. The guy must have been very convincing for Dewey to trust him that much because once he climbed in the front, he had no control. Unfortunately, the so-called pilot got the airplane into a flat spin – a very dangerous situation – and there was nothing Dewey could do to stop it. The family story goes that in preparation for a crash, Dewey took his goggles off, put them in his pocket and waited for the inevitable. He survived, but suffered several injuries, including broken facial bones. The other guy wasn’t so fortunate. Dewey and his friend Blaine Tuxhorn bought a Bahl Lark monoplane made in Nebraska. It was a single seat parasol where the fuselage hangs below a single wing, attached by struts and flying wires, powered by a three cylinder engine. A terrible flying airplane, Dewey and Blaine re-designed it, naming it the Bonbrake Parasol. From this Dewey developed the idea for the airplane that would later be known as the Inland, which is where all this history is headed. See you next week with more on the Inland’s fascinating story. Til then, blue skies. Photos courtesty Lance Borden, from family photo ablums. Mike: Last week we wrote about Bill Ford, one of the veterans our friend Vickie Croston accompanied as guardian on a recent Honor Flight Network trip to Washington, D.C. This week we introduce you to her second charge, Gerald Roop. From Oklahoma City, Gerald Roop (OU ’42), was drafted in December 1942, serving in Europe for four years and an additional two years during the war in Korea. After basic and officer training at Fort Sill he was commissioned a second lieutenant in September 1943. Sound and flag observation school at Camp Gordon, Georgia made him a sound platoon officer. Gerald’s platoon of 30 men, part of the 291st Observation Battalion, used microphones and observer posts to listen for shells as they flew overhead. By timing them they figured out the shells’ point of origin and directed return artillery fire accordingly. During the winter of 1944/45, the coldest winter in Europe in 45 years, Gerald’s platoon located 65 enemy gun positions during the Battle of the Bulge. Wounded by shrapnel during his tour in Europe, Gerald witnessed the aftermath of the Malmedy Massacre where more than 100 U.S. POW soldiers were machine-gunned down by their German captors. The German officers were later tried for war crimes and executed. After the war in Europe ended he was supposed to go to Japan, but his unit was disbanded. The Navy was looking for liaison pilots so he applied and was accepted. However, while he was still in France the first atomic bomb was dropped, ending the war in the Pacific, so he didn’t go to flight training. Later, while commanding a gun battalion in 1st Cavalry Division in Korea his position was overrun by North Koreans and he was wounded again – shot in the hip. For the remainder of his time in service, Gerald returned to Fort Sill, using his combat experience as a gun instructor. Linda: Gerald still wanted to fly, so after the service he received some training. He logged 60 hours, but a new civilian life – work and family – came first. His trip to Washington, D.C., provided free through the Honor Flight Network, gave him an opportunity to visit the memorials there, to reflect, and be honored and thanked. We’re saying good-bye to over one thousand World War II veterans every day. Time to express our thanks is of the essence. This series on Honor Flight Network shows just one of many important ways aviation is part of good things bigger than itself. Visit www.HonorFlight.org. Linda: En route to the Grace Flight Air Race in Sherman, we stopped for lunch at Southern Flyer Diner at the Brenham airport. Vickie Croston had two special people for us to meet: Bill Ford and Gerald Roop, two friends she met through her involvement in Honor Flight Network, a non-profit organization that honors America's veterans for their sacrifices. Honor Flight Network, transports our heroes to Washington, D.C. to visit and reflect at the memorials, free of charge. When Montgomery Jr. High School history teacher Brenda Beaven began organizing Honor Flights in Houston she got the attention of her principal, Duane McFadden, who was compelled to get involved. Together they’ve coordinated five flights to Washington-Dulles aboard chartered 757s and 737s. We’re saying good-bye to over one thousand World War II veterans every day. Time to express our thanks is of the essence. As trips are scheduled, senior-most veterans along with those who are terminally ill receive top priority. Volunteers accompany the heroes as guardians; Vickie was Gerald and Bill’s. Mike: Upon landing at Brenham, as we approached the on-field diner, Vickie and her two charges were resting comfortably in the shade of the large covered porch. Joining us on the restaurant’s deck that faces the runway, they shared their stories. Bill Ford was born in New Orleans where his dad worked for the railroad, but a farming life was calling so the family moved to Navasota. Three months before World War II ended Bill entered the Navy. As a Quartermaster Signalman he was trained in the use of navigation and communication radios and visual communication using flags and lights. Bill still remembers Morse Code and wowed us with a perfect demonstration of the Semaphore flag signaling alphabet. His first ship was a 160-foot long wooden minesweeper that went ahead of the forces into bays around the Marshall Islands dragging a “pig” behind it to cut the cables used to hold mines submerged below the water’s surface. The mines were magnetic and the wooden hull of the minesweeper didn’t attract them. Once the mines floated free they shot them. For most of his time in the Navy Bill was assigned to the LSD-22 USS Fort Marion, a Landing Ship Dock transporting Marine troops during the Korean conflict. The Fort Marion was eventually bought by Taiwan, used in their navy, decommissioned, then sunk and used as a diving reef. But no matter where it is, that ship is part of very important memories for Bill Ford, and reasons for gratitude for us. Linda: 130 veterans from Bryan/College Station and Conroe were on Gerald and Bill’s trip, welcomed at both the departure and destination airports with a salute ceremony. Water cannons formed arches over their taxiing aircraft on departure and again on arrival. Buses, escorted by sheriff and city police motorcycle guards took the veterans to the WWII Memorial, followed by the Korean Memorial, the Vietnam Wall, the Changing of the Guard and the posting of colors at the Tomb of the Unknown Soldier at Arlington National Cemetery, then to the Iwo Jima Memorial and finally the Lincoln Memorial. Breakfast and dinner were served on fine china on the plane and a boxed lunch provided on the bus. The trip, thanks to donations and volunteers, serves as a “Thank You” to our brethren who have given so much. Come back next week to read about Mr. Roop, another hero who took an Honor Flight.